The Enormous are basically Kaiju created via a vast ecological cataclysm. In fact that's exactly what it says in the description of the one-shot published last year. In the midst of a planetary crisis for food and fuel, a vast ecological cataclysm has spawned massive beasts unlike anything ever witnessed. Humankind struggles to stave off extinction and the only law is hunt or be hunted. 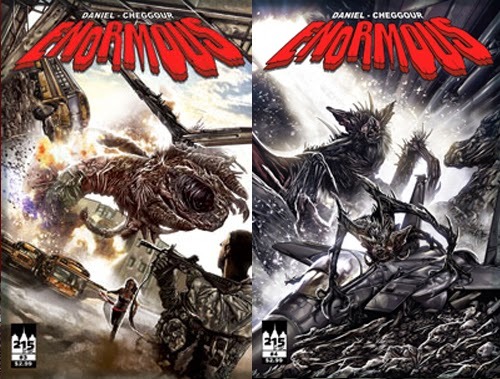 Universe G - Were you influenced by Japanese pop-culture and TOHO's Godzilla and other Kaiju movies and now that Pacific Rim became a huge success in American theaters and around the world, do you think your graphic novel Enormous could bring to life the world in the novel in a motion picture? Tim- Absolutely, yes, I grew up watching horror movies on Friday night Creature Features and Godzilla films on Saturday afternoons. All of that has stayed with me through time and I’m pretty excited by the resurgence of interest in giant monsters in general. 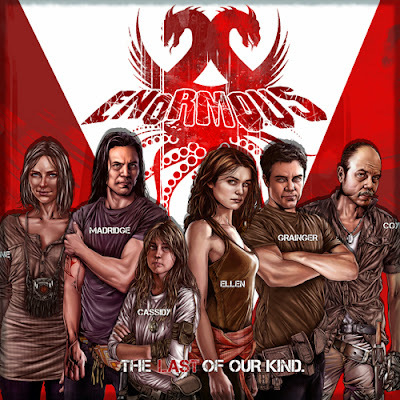 Films like Trollhunter, Cloverfield, The Host, Monsters, and The Mist had a huge influence on Enormous, each being homage in the story. Pacific Rim was big fun and the more I’ve watched it, the more I enjoy different aspects of the film. Given the film’s subject matter, I was pretty nervous at first, but Enormous could not be further away from Pacific Rim. If Enormous somehow manages to climb into the general public’s consciousness and even comes close to entering that realm, both Mehdi and I would be pretty shocked. Universe G - I recently was visiting the Enormous website looking to see if the on screen adaptation for your graphic novel is progressing. Is there a production company already involved and a script for the screen adaptation and could you tell us when will this project start or has it already started. Based on IMDb, your graphic novel is gearing up for a motion picture with no info on a release date as of yet or do you have one but cannot talk about it? Tim- Never trust a website (we’re in the midst of an update). Here’s what I know and I’m at liberty to share. 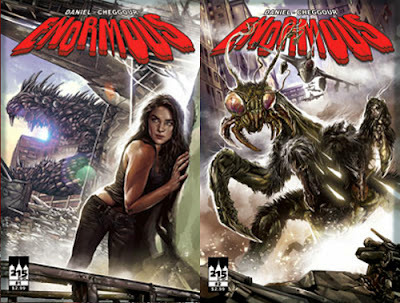 Enormous is being actively adapted for the screen. Producer Adrian Askarieh’s Prime Universe Films is heavily involved. The first step he took was to recruit Writer-Director André Øvredal of Trolhunter – which made me swoon. I’ve seen several treatments and scripts to date. They are fantastic, in keeping with the spirit of the story established in the One Shot while building smartly upon the world of Enormous. For our part, Mehdi and I have contributed a wealth of development materials to the production, including some fresh designs on the creatures. And both Adrian and André have been wonderful with concern to seeking our input or sharing information. And if you are unfamiliar with the Trollhunter reference enjoy the clip below. The entire movie is worth the watch and there is an great example of a Kaiju-sized troll. You can go to the official Enormous Comic Website. You can and also check out Damian Bravo's Godzilla Fan Universe for other Godzilla related news.